Stocks are getting crushed this morning after the FOMC decision to not raise rates. Bonds and MBS are rallying. The index of leading economic indicators rose 0.1% in August. The Fed maintained rates yesterday, citing concerns over the global economy. Bonds rallied on the news while stocks rallied initially and then sold off. Even the statement was dovish. The new economic forecasts lowered GDP, unemployment, and inflation projections. 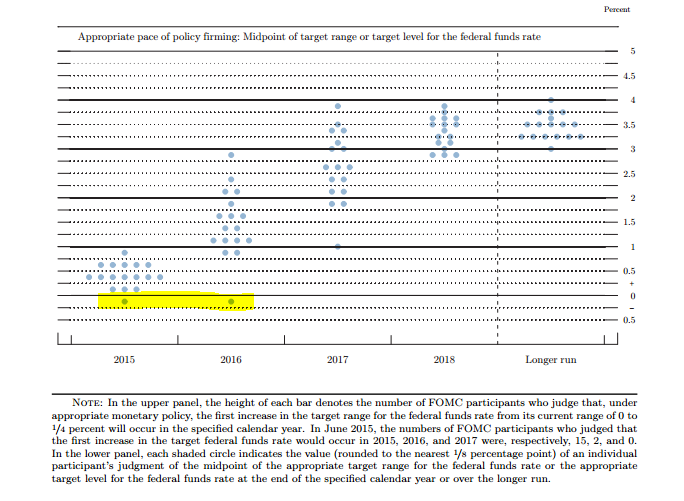 The dot graph showed FOMC participants are forecasting lower interest rates through 2018 than they were in June. In fact, one participant thinks rates should be lower! Take a look at the dot graph below. Someone is predicting the Fed Funds rate should be negative this year and next. That is new. GDP is lowered, as is unemployment to below 5%. 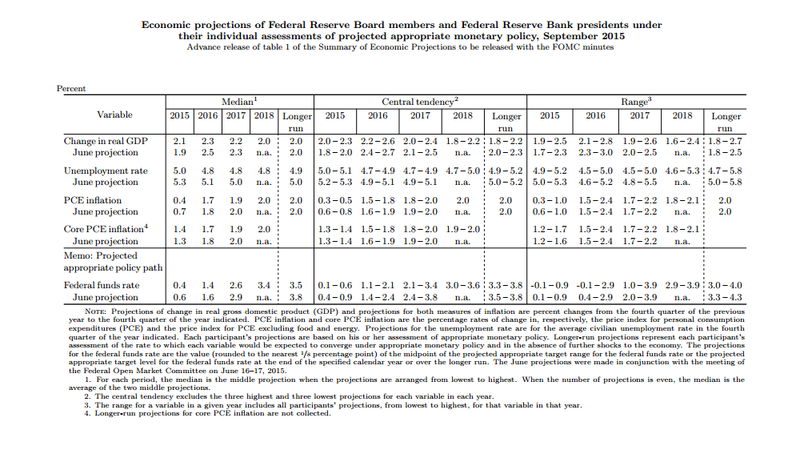 Note the Fed doesn’t think it will hit its inflation target of 2% until 2018 (!). To me, this means the Fed is anticipating that the labor force participation rate is going to stay low – that is the only way to explain low unemployment and low GDP. They also seem to think that the overhang of these workers on the sidelines will be enough to keep wage inflation low. What does that mean for bonds and mortgage rates? If that forecast plays out, you could see short term rates increase and long term rates really not move all that much. To me it means a few more years of mortgage rates right around where they are now. This should be good for housing. Brent, they won’t say it, but from past history they don’t change rates while the appropriations bill is approaching a deadline. After the POTUS signs a bill Congress gives him then the Fed can act. Clearly we cannot have zero rates forever – that must encourage asset speculation, when we begin to believe OPM has no real use cost. W/ debt service in $18 trillion how could a big government advocate like Yellen raise the rates? Each extra dollar paid in higher interest can’t go to more milk from the teat? Who here disagrees with this and why? I put in the wrong link, now fixed. cash out refi 5/1 ARM & 15 year at 2.89.
would have 85% LTV and pay off a 2nd, come credit card debt and a the car. and pocket a not insignificant amount of cash. @Troll: I disagree with it, because (and I admit I read only the first two sentences) it’s like the Catholic Church and Galileo. I don’t think that the scientists denying AWG are correct, but you don’t prosecute someone over a scientific dispute. The Fed is giving you a gift of ultra-low interest rates. I would borrow as much as I can as long as I can..
Feminine hygeine products should be provided free by employers… I guess this is going to be the new cause celebre? I took a colleague’s blood pressure once in the women’s room. i mean unimaginable luxury palace that is lady’s room. sofa, stocked variety of soaps and toiletries. no pee on the floor. maybe Bruce Jenner is onto something. Who are these idiots? Nothing could possibly make their case look weaker (or more religious than scientific) than asking the government to prosecute AGW heretics. For scientists, they either aren’t very smart or their moles, trying to make the AGW-consensus folks look so unscientific that they have to have the government prosecute their critics and thrown them in jail rather than refute them with actual scientific evidence. Da Comrade… Should we have them imprisoned or just shot? I’ve worked at universities too long. I need to come work where they have ladies rooms like this! As far as the free feminine hygiene products goes, I didn’t click your link, Brent, but it would seem like, in the case of an emergency (and they have happened to all of us, just ask your wife) it would be nice to be able to get something at work so that you aren’t bleeding all over your desk chair, don’t you think? Put a dispenser in the ladies room. Done! Do you, by any chance, know anyone in OSHA? That seems. . . excessive. What KW said. These people live very difficult lives. I’d love to hear more about the parents. I’d like to hear if Obama plans on inviting every victim of a school administration overreaction to the White House, or just those with Muslim names. This type of thing happens all too regularly, but Obama never jumps into the fray when the victim is, for example, an artistic white kid. Wonder if the Secret Service will bother inspecting the “clock”? This broad followed Fauxahontas’s career path. Meet New Hampshire’s next Senator! I wonder how proponents of the theory that education is a public good account for the existence of ethnomusicology as an area of study within the education establishment.